Scarce late edition of Ernest Dudley Chase's iconic map of Cape Cod showing the Kennedy Compound. Picture Chart of Cape Cod, Martha's Vineyard and Nantucket. 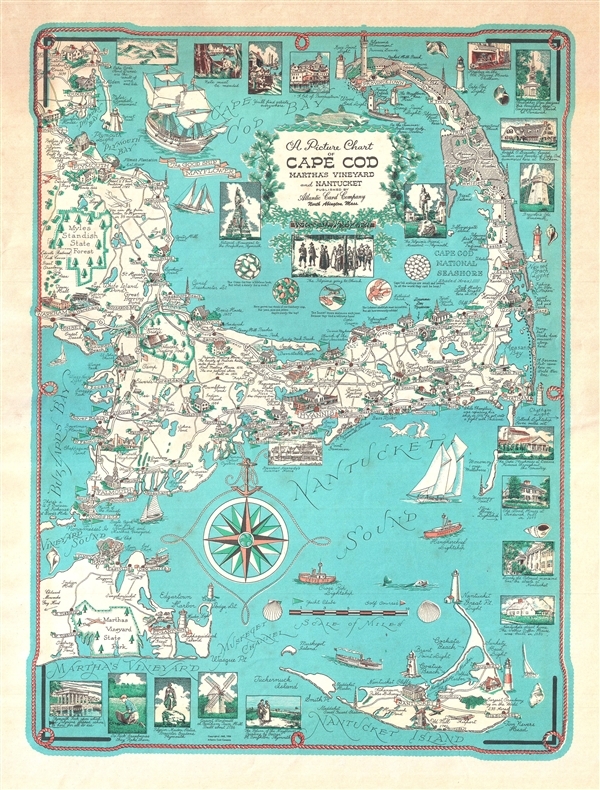 This is a c. 1960 revision of Earnest Dudley Chase's iconic map of Cape Cod, Martha's Vineyard, and Nantucket. The map covers from Marshfield to Nantucket and from Martha's Vineyard to Provincetown. It includes the additional historic towns of Duxbury, Kingston, Plymouth, Falmouth, Hyannis, Chatham, Wellfleet, Nantucket, and Edgartown, among many others. Historical sites are rendered in profile. Surrounding the map there are countless vignettes, most of which are annotated with descriptive text, some quite humorous. President Kennedy's Summer Home is in evidence near Hyannis Port – a revision that appeared c. 1960 after Kennedy was elected. Chase first drew this map in 1949. It proved popular and was issued in large, medium, and small formats. The present example is a small format issue. In 1955 Clara Chase, Earnest's wife, revised the map and reissued the copyright in her own name. A later revision followed in 1960 in which 'President Kennedy's Summer Home' was added to the map near Hyannis Port. The time Clara's imprint has been removed and replaced by the imprint of the Atlantic Card Company. Ernest Dudley Chase (1878-1966) was an American illustrator of greeting cards and pictorial maps active in the first half of the 20th century. From his studio in Winchester Massachusetts, Chase became famous for his elaborately illustrated pictorial maps. He was born in Lowell Massachusetts and attended the Lowell Textile School and the Vesper George Art School. He took work with Butterfield Printing Company in 1900. In 1906 he moved to the W. T. Sheehan Printing Firm. He began producing postcards and greeting cards on his own account in 1908. This initial imprint was Des Arts Publishers, but later he changed it to Ernest Dudley Chase Publishers. Chase is best known today for his distinctive pictorial maps, most of which he published privately, characterized by densely packed vignette images of important locations. The biographical pamphlet A Meticulous Maker of Maps describes Chase's attention to detail wherein, pursuing a 'passion for perfection' by stippling his images 'dot-by-dot, with tiny pens' under a magnifying glass. His impressive corpus includes nearly 50 maps focusing various parts of the United States and Europe. Most are thematic, focusing on topics such as wonders of the world, stamps, aviation, and war. Others, such as his map of The Untied States as viewed by California and Loveland are satirical in nature. All are highly coveted by collectors today. Cassini, G. M., Nuovo Atlante Geografico Universale, (Roma : Presso la Calcografia Camerale) 1797. Good. Light margin soiling, else clean.